Sat in the most advanced single-pilot fighter in the galaxy, Graceful Explosion Machine delivers a joyous, eye-popping assault on the senses. After becoming lost in deep space, your last resort is to seek refuge in an unknown world – a decision that only unsettles their extraterrestrial inhabitants with your unexpected arrival. Launching their own swarm of fighters to fend you off, this alien species will soon become aware of the potent quad-weapon array that your ship carries. Enduring kaleidoscopic bullet chaos is your main goal in this side-scrolling arcade shooter, which delivers an increasingly intense challenge that builds on developer Vertex Pop’s experience in crafting the similarly crazed twin-stick shooter We Are Doomed. This Nintendo Switch timed exclusive will see players take on level after level across four worlds, in which they look to rack up the highest score possible by mercilessly obliterating any enemy that dares to fly in their direction. It’s all about style, keeping out of danger, and wiping out everything in sight in the quickest time possible, your fight for survival steadily building a combo multiplier that will let you reap as many points as you can. This rate of reward is well calculated, even if accumulating enough points to achieve higher ranks can feel elusive. With multiple phases to survive in each level, the environments, smartly, loop around to make sure that you don’t end up cornering yourself in a particularly vulnerable position. 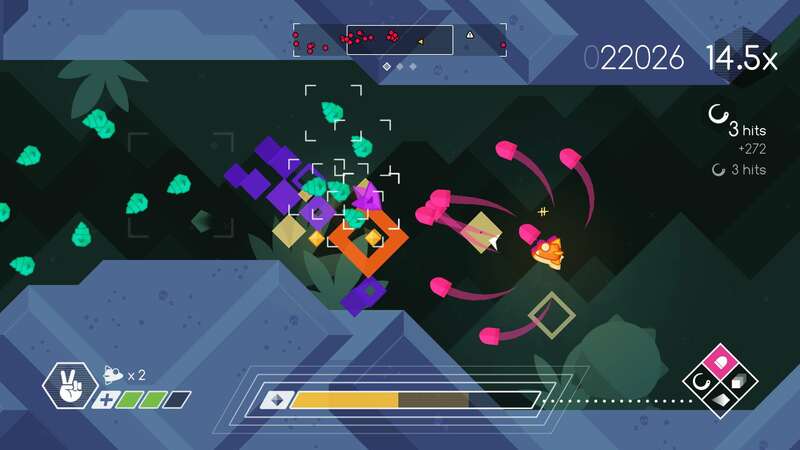 The Graceful Explosion Machine has surprisingly nimble movement, with players free to quickly flip themselves in either direction as well as having a chance to dodge out of harm’s way. However, as the old adage goes, the best defence is a good offence. Where their weapon of choice was once an overpowered laser beam, Vertex Pop lock and load four devastating weapons for players to unleash at the enemies that swarm around them. The Blaster is your core weapon, which unleashes energised pulses that can easily deal with most enemies – although you will have to pace your shots to save it from temporarily overheating. Your fighter also comes equipped with an Energy Sword that, when used, performs a circular attack around your location to clear enemies that are too close, and a Sniper Beam that powers up in a matter of seconds to build an almighty blast that projects directly in front of your ship. The last choice in your quad-weapon array are Missiles, which energetically ricochet off surrounding surfaces to collide with your enemies. The Energy Sword, Sniper Beam and Missiles all use a shared energy gauge that is refilled with diamond-shaped resources that your fallen foes leave behind. It is the Missiles that drain the gauge the quickest, which is understandable, given how devastating it is to hurl the neon pink projectiles at unsuspecting enemies – the game gleefully displaying a Missile Heaven emote in the ensuing chaos. Completing each world will unlock a Score Attack and Warp stage in Challenge Mode, which offers an endless run against the clock and a merciless endurance test, but most will fixate on climbing online leaderboards to prove their skill. Graceful Explosion Machine scores other successes in its boldly vibrant and yet minimalist aesthetic, as well as a synthesised soundtrack that is perfectly in keeping with the game’s jubilant style. It’s hard to really find any clear complaints, but, as a game that was touted for supporting HD Rumble in the Nintendo Switch Nindies Showcase, the force feedback feels noticeably subdued. Damon Baker promised that we would “be able to feel those machines explode,” but the result comes as a disappointment. Whether this is something that developers are still working hard to understand hope best to implement is unclear, but I hope that there is a chance that it could be improved with an update. Graceful Explosion Machine basks in its gloriously vibrant neon bullet hell, delivering a joyously chaotic experience that will often have you panicked but is unendingly gratifying as you destroy the enemies that surround you.